The issue of player health and well-being has been an issue of great importance in the postings on this blog; and no issue captured my attention more than that of concussions and the impact of repeated concussions on the cognitive skills and memory of of players and former players. No comes a report on a study conducted by the University of Michigan's Institute for Social Research that contributes to a growing body of literature that points to significant long-term memory issues for those players who suffer repeated concussions. The study is far from perfect ~ it involved a phone interview of former players ~ but several researchers, including a former team doctor of the Steelers, believe that (to put this into the football vernacular) moves the ball down the field. One researcher went so far as to say that "there appears to be a problem with cognition in a group of N.F.L. football players at a relatively young age." For their part the National Football League continues to employ the Phillip Morris defense ~ i.e. nothing has been proven, plenty of former players are fine, more research needs to be done ~ but promises it is taking the matter seriously. "After two consecutive Super Bowl wins, the 1976 Steelers began the season slowly, dropping four of their first five games. But they allowed a paltry 28 points over the next nine games - all of them victories - to win the division for the third year in a row." ESPN Chicago is reporting that the Bears are in the process of re-sodding Soldier Field. Bears' running back Matt Forte is concerned enough that he discussed the situation on radio station ESPN 1000. Fans of the Steelers have their own special memories of how re-sodding projects can go horribly wrong. 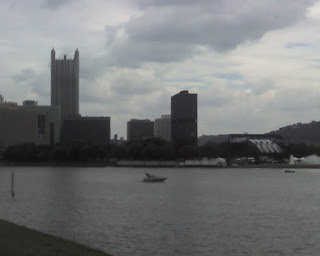 On Monday, November 24, 2007 the Steelers hosted the Miami Dolphins at Heinz Field. A driving rainstorm left the recently re-sodded surface a quagmire ~ who can forget the kicked ball sticking into the ground nose first? ~ with the Steelers winning 3-0 on a late field goal by Jeff Reed. Current weather forecasts predict sunny weather for the Chicagoland area throughout the weekend, with rain moving in Monday evening. Let's hope the rain holds off at least that long. Why does the NFL hate America? A recent posting at Consumerist.com about the relatively large number of games expected to be blacked out in local markets this season got me to wondering just why the NFL is so inflexible in its approach to permitting fans of the NFL, who happen live in this country, to watch the games live. In that Consumerist posting NFL commissioner Roger Goodell expresses empathy for all the fans who, as a result of the economic downturn, are no longer able to purchase game tickets. For those fans who are unable to see their team play in person, and whose games are blacked out, the NFL will allow them to watch the game tape delayed, online. It can be argued that something is better than nothing ~ this does represent something of a step in the right direction; however in Canada the Sunday Ticket package, which is only available via DirecTV in the United States, is available through cable operators. Moreover, in Europe NFL games stream live on the internet. In an effort to cultivate fans in far-flung parts of the globe it seems that the NFL is, once again, giving short-shrift to those who made the league the financial and entertainment juggernaut that it is. Are the owners coming unhinged? With a potential of a work stoppage looming off in the distance (something that too many of the NFL's media partners have ignored) it was interesting to read about comments from Jerry Jones concerning revenue sharing, and Roger Goodell's response. There has been a simmering tension between the old school owners (e.g. the Rooney family, the Mara family, et al) and the new school owners (e.g. Jerry Jones, Dan Snyder, et al) ~ many of whom leveraged their respective finances to the hilt in order to obtain their respective franchise. The ability of team's to compete in a real way (i.e. get to a Super Bowl), and not the sham competition that we see in major league baseball, is a direct result of the revenue sharing that was implemented decades ago under then NFL commissioner Pete Rozelle. Jerry Jones has long chafed under the revenue sharing arrangement, and opted out of the NFL Properties revenue sharing plan years ago (after paying a fee to the league to do so). Additionally, Sports Illustrated reported nearly ten years ago of Jones' desire that teams retain all internet revenues for themselves while Patriots' owner Bob Kraft advocated a sharing of those revenues as well. All of this is significant as it relates to the collective bargaining situation with the players. If the owners are divided amongst themselves it is not difficult to imagine a scenario in which the players can exploit that to their benefit. This blog (actually, it was originally "Steelers Fanatic") was created as an outlet for a passion about the greatest team in the National Football League. Along the way writing became a passion all its own, and for a few years the blog was tended to faithfully. However, as you have no doubt noticed, the posts have become fewer and fewer and as a result it seems that it is now time to admit that despite a continued passion for the football the blogging does not hold the same allure it once did. As a result the active phase for this blog is now at an end. There may be an occasional posting now and again, and the schedule and results will be maintained, but that is about all that will happen. Thanks for reading and go Steelers!! September 11th is no longer just another day, and the connection between Western Pennsylvania and the events of 9/11 presents itself even at Heinz Field. 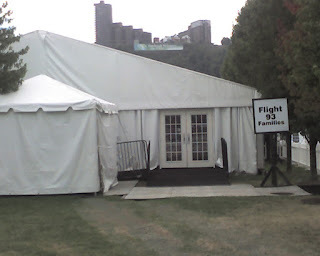 This is a hospitality tent just outside gate A. After lots of sun earlier in the day the skies are now overcast and the breeze is picking up. If you look to the right of the image you can see the stage doe tonight's concert. 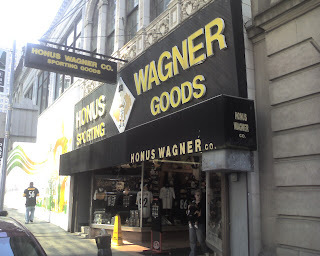 No trip to Pittsburgh, especially those for Steelers' games, is complete without a visit to Honus Wagner Co. On Forbes Avenue.